The Montresor family has its roots in France. The count Claude de Montresor had a prominent important historical position during Cardinal Richelieu days and he took part to the political events as prime counsellor of Duke d’Orleans, the cousin of the king. In the sixteenth century, a branch of the family moved from Château Montresor, in the Loire valley, to Verona, Italy. There, they acquired lands, estates, and started the culture of the vines. 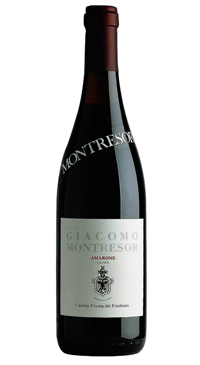 When Giacomo Montresor, in the second half of the 19th century, started to sell the wines he produced under his family name, he could not imagine that one century later his wines would have reached the four cardinal points of the world. Today his successors carry on this tradition which associates the agricultural activity to selecting, ageing, bottling, and distributing operations. After harvest, the grapes are left to dry for 4 months before traditional vinification and cask ageing. Concentrated red and black berry dried fruit and sweet spices on the nose and palate. Full bodied and rich with a long smooth finish.